Money Clip with a credit card slot and an ID slot. 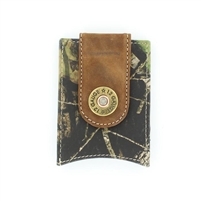 Exterior money clip, with two interior slide pockets and 6 credit card slots. Exterior money clip, and ID window. Credit card slot and gusseted card slot. metal bottle opener money clip with three credit card slots on back one on front and a side slide pocket as well.